"This is a quick and easy bar. It has raisins and nuts in it. Great with a hot cup of coffee or even a cold glass of milk. My daughter likes them as an after school snack. Cut into bars and frost while still warm with confectioners' sugar glaze or let them cool and frost with cream cheese icing." Preheat oven to 350 degrees F (175 degrees C). Grease a 13x9-inch baking dish. Beat shortening and brown sugar with an electric mixer in a large bowl until smooth. Blend egg into the shortening mixture. Add hot coffee and stir. Sift flour, baking powder, cinnamon, baking soda, and salt together in a separate bowl; stir into the shortening mixture. Fold raisins and chopped nuts into the batter; spread into the prepared baking dish. Bake in the preheated oven until a toothpick inserted into the center comes out clean, 18 to 20 minutes. Cool in the pan for 10 minutes before removing to cool completely on a wire rack. 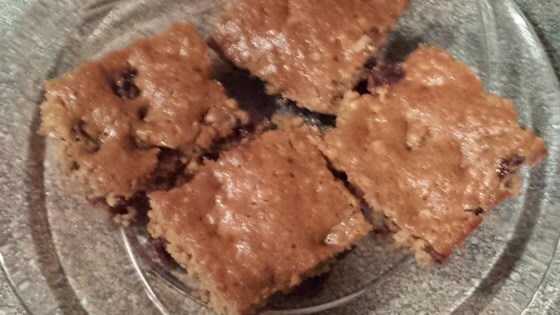 Tangy, sweet cookie bars you’ll love!